A rousing game of Stone The Israeli Tank. Stone The Israeli Tank is one of the most popular sports of the Palestinian people, along with Jew Hunting (itself trialed as an Olympic sport in the 1972 Munich games, to mixed popularity), Who Can Blow Up The Most People, and Curling. It is one of the major sources of profit for the Palestinian Authority. Considered by many to be the national pastime of Palestine, the sport is fun for the whole family and has been practiced for many generations by Palestinians of all ages. The earliest recorded instance of Stone the Israeli Tank occurred in Biblical times. In the Book of Leviticus, several gentiles throw rocks at the son of Aaron while he is on horseback in order to knock him off and abscond with his golden calf-smelting materials. Other similar incidents probably occurred around these times, but they are not well documented as ancient scribes were all too often the object of primitive Stone the Israeli Tank sessions. In 77 AD, the noted historian Pliny the Elder wrote down an account of several Jews hiding in a hay wagon being discovered and stoned, and the subsequent stoning of the hay wagon for good measure. Solo Stone The Israeli Tank games are rarely successful. Stone the Israeli Tank enjoyed huge popularity during the Middle Ages and the Medieval period. The Palestine region was often the subject of extremely long sieges. yet they were rarely successful as a rousing round of Stone the Israeli Tank directed at an enemy catapult or trebuchet would stop the offensive cold. 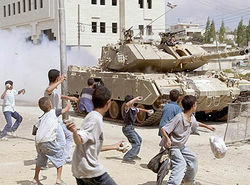 The sport grew in popularity to the point that some historical records claim that the Muhammed Abu Fayed, Caliph of Jerusalem in the 1390's, had to outlaw Stone the Israeli Tank because citizens were spending too much time playing it and neglecting their normal jobs. However, this surge in popularity would spell disaster for the Palestinian people. Renowned Arab historian Abu Merkava has even gone so far as to suggest that the reason the Ottoman Empire was able to conquer the Palestine so quickly is that all of the soldiers were playing Stone the Israeli Tank instead of training. The sport suffered a decline in popularity, to the point where in the years preceding the turn of the 20th century the sport lost almost all of its following as other, more violent sports such as Behead the Defenseless Nun grew in popularity. It is only in the years since the creation of the state of Israel that Stone the Israeli Tank has regained its present popularity. Young Palestinian men partake in a Stone the Israeli Tank Tournament. In 1983, the Israeli Army was rolling through Lebanon towards Beirut. A column of tanks was mercilessly crushing anything vaguely Arab. Suddenly, a group of youngsters appeared on a streetcorner. Before the Israeli Tank crew could react, they were pelted with dozens upon dozens of medium-sized stones. When the projectiles rang off of the steel hull it reverberated inside and produced a mildly annoying sound. Undeterred, the tank rolled on. Thus, the modern incarnation of this ancient sport was born. Soon the game spread to all of the Palestinian territories, where it soon became the sport everybody was talking about. Israeli soldiers enjoyed the games against the residents of South Lebanon so much they stayed there for the best part of twenty years. Stone the Israeli Tank is governed by a few simple rules. First, an Israeli tank approaches. 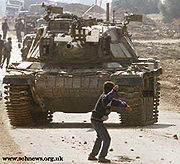 Then, Palestinians throw stones of various sizes at the tank. Since the tank is made of heavy, modern armor, the stones have no effect on the tank. The tank crew has two choices: they can either ignore the stone-throwing Palestinians, or shoot back at them. Most tank crews choose not to shoot back, though if they choose to do so the game is over. ↑ Palestinians are the only non-Canadians to enjoy curling; probably because they are illiterate. ↑ Similar to America's national pastime of baseball, or England's national pastime of making up Oscar Wilde quotes. ↑ By the Jews, of course. ↑ Such as yarmulke maker or bagelist. ↑ Now that's Arab hospitality!